Our riding holidays give you the best of both worlds – comfortable, smart self-catering accommodation in our newly-converted cottages, combined with some of the best off-road, outriding in the country. We can tailor your holiday to suit you. 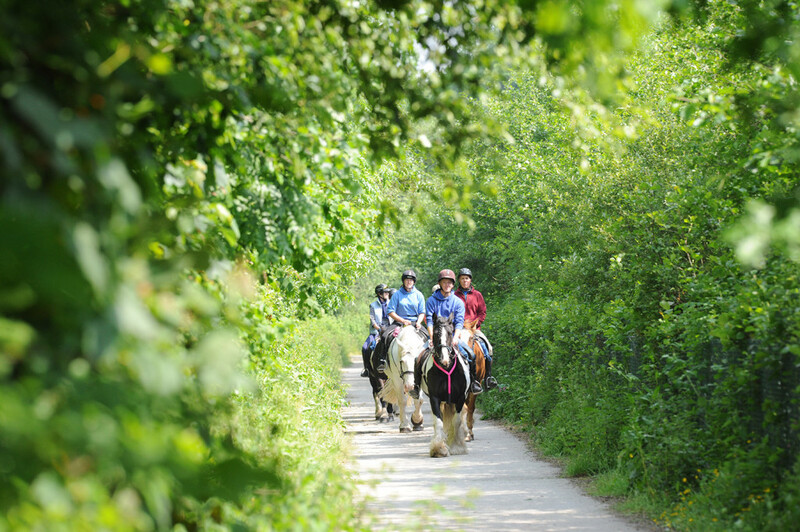 Whether you are a group or a family of complete beginners or mixed abilities looking to learn to ride or improve, or a group of keen riders looking for more of a challenging equestrian holiday in Cornwall, we have the horses and rides to suit you. And for non-riders, there are plenty of activities close by. We’ve fantastic moorland walks, of course, but we’re also close to several moorland inns, the Camel Trail and only a thirty to forty minute drive to the beaches of the North Coast, Eden Project and Truro. See our Surrounding Area page for more ideas of what to do when you are not in the saddle. Firstly, choose from our range of Riding Holidays below. Then simply add the “per person” cost to the cost of your self-catering cottage. We request a minimum of two riders per group for both packages. Out of the main holiday seasons, (Easter, Whitsun, July and August) we can provide a fully-catered riding holiday for more experienced riders. Click here to find out more about our Trail Riding Holidays and to see an example of a week-long itinerary. Shorter breaks are also available on request and subject to availability. Our friendly staff have lots of experience in introducing new riders – young and old – to the joys of riding. Following an initial assessment, your riding holiday includes up to one hours’ riding per day (excluding arrival and departure dates), with combining tuition and moorland hacking to build your confidence and improve your riding ability. Extra sessions can be arranged if required. Cost: £140 per rider, per 7 day stay (rides on 5 days). For intermediate/experienced, we can offer an intermediate/experienced package. The day after your arrival, we’ll assess your riding ability first in the sand school and then during a one hour hack on the open moorland. Once we’ve fully assessed your riding ability as suitable for this package, you can then enjoy up to two hours’ hacking per day (excluding arrival and departure dates) across this amazing riding country. Cost: £220 per rider, per 7 day stay (rides on 5 days). 2. Add the costs of your chosen riding packages together to get your Riding Total Cost. If you require 14 days stay then please select 2 x 5 day riding packages to cover both weeks. 3. Select the self-catering cottage of your choice to check availability and pricing. 4. Add the Accommodation Cost to your Riding Total Cost to give you the Total Cost of your holiday. Please note: We require a £200 damage deposit (refundable, as per our Terms and Conditions.) Please call us on 01208 851500 if you would like further information.